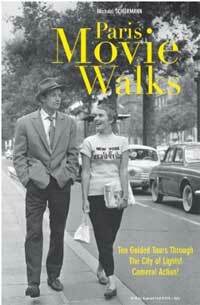 The author of the book “Paris Movie Walks” will lead a free walking tour of famous film locations on November 25, 2009 at 4:00 p.m., starting from Shakespeare and Company, the famed Left Bank English language bookstore. Michael Schürmann’s book, subtitled “Ten Walking Tours Through the City of Lights! Camera! Action!” lets walkers see the famous sites and quiet neighborhoods of Paris as seen in famous films, from Hollywood blockbusters to New Wave classics to the most recent art house releases. The hour-long walk will take in Notre Dame Cathedral and Rive Gauche locations as Schürmann recounts tales of the filming of such films as An American in Paris, Breathless (A Bout de Souffle), and Before Sunset. After the walk, back at Shakespeare and Company, Schürmann will sign copies of his book. Shakespeare and Company is located at 37, rue de la Bucherie, just steps from the Seine, in the 5th arrondissement. The nearest Metro stop is St. Michel-Notre Dame. For more information call 33 (0) 1 43 25 40 93.